In a small bowl, combine tamari, ginger, agave, Sriracha sauce (if using), 1 tablespoon water, and 1 teaspoon cornstarch. Set aside. In a bowl, whisk together the egg whites, ¼ cup cornstarch, salt, and pepper. Stir in sesame seeds. Set aside. Heat 2 tablespoons oil in large skillet over medium-high heat. Dip chicken in egg white mixture and let excess drain back into bowl. Add chicken pieces to skillet, being careful not to overcrowd (you may need to do two batches, depending on the size of your pan). Cook until golden brown, about 4 minutes per side. Transfer to plate and keep warm. Heat remaining 1 tablespoon oil in wok or skillet over medium-high heat. Add the white pieces of bok choy and cook for about 3 minutes. Add the red pepper and cook for about 2 minutes. Add the green pieces of bok choy and cook about a minute. Add the tamari mixture and cook until liquid has thickened and bok choy is tender, about 3 minutes. Serve bok choy with chicken. 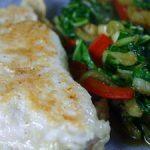 This recipe is a good source of Vitamin B6, Folate, Phosphorus, and Selenium, and a very good source of Protein, Vitamin A, Vitamin C, Vitamin K, and Niacin.